At the end of the MLB regular season, I wrote a long, rambling diatribe explaining why Mike Trout should be the American League MVP. It was laced with charts, stats, and condescension. The problem was that every time I tried to finish or edit this monstrosity, I felt like I was looking at Carrie Mathison’s 65-page college missive deconstructing music theory. It wasn’t that I was wrong. I was, and remain, absolutely correct. You just had to wade knee-deep through convoluted evidence piled on top of itself to get to the point I was trying to make. Short version: I wrote something that sucked. Here’s take two. As Ringo Starr would say, forgive the lateness of my reply. On November 15, Miguel Cabrera will be named 2012 AL MVP. He will not deserve it. He won’t be the worst choice in history; not by a longshot. The case for Cabrera is relatively straightforward: He had an awesome offensive season. He won the Triple Crown. His team made the playoffs. He’s a future Hall of Famer in his prime who has never won the award despite several MVP-caliber seasons. That’s all well and good, but Trout had a better year (apologies to the Justin Verlanders and Robinson Canos of the world, but this is a two-man race). To the first point, Cabrera did indeed have a wonderful season at the plate. The problem is that it was only slightly better than Trout’s. They finished first and second in pretty much every advanced offensive category (it was about 50/50 who was first and who was second). That Trout missed the first month of the season makes his year all the more impressive. He doesn’t get credit for it, but it’s pretty remarkable that Trout could provide roughly the same offensive value in 5/6 the time. I’ll be honest when I say that I don’t understand the intricacies of most advanced statistics, but I believe them to be accurate—the offensive ones, at least. There are some more basic stats that tell the tale. 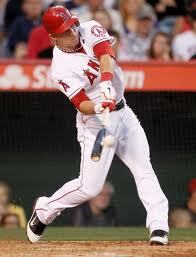 Cabrera led MLB with 377 total bases, while Trout had 315. Factor in walks, HBP, stolen bases and caught stealing, and then Cabrera leads 449-432. That still doesn’t factor in the full weight of speed on offense, ignoring Trout’s ability to go from first to third or score from second on a single or from third on a short sac fly; not to mention Cabrera’s staggering 28 GIDP. A simple but useful metric, Baseball Reference’s WAR, has Trout ahead of Cabrera 8.6-7.4. Defensively, these two men are near polar opposites. Trout plays an outstanding centerfield, while Cabrera was, charitably, sub-mediocre at third base (I’ve heard the term “butcher” thrown around). With defense factored in, BBRef has Trout’s WAR at 10.7, with Cabrera’s at 6.9. Did Cabrera have a superb offensive season? Absolutely. Was Trout’s roughly equal, only with the added bonus of top-notch defense? Without question. The Triple Crown seems to be the driving force behind Cabrera’s campaign, which is rather silly. If Josh Hamilton or Curtis Granderson had hit two more home runs this season, would that have made Cabrera any less valuable? Never mind that RBI is a stat that indicates little other than opportunity and basic competence. Even accounting for the lack of meaning in the Triple Crown, we can look at history and see how past MVP voters valued the statistical anomaly. There have been 11 Triple Crown winners during an era with either the MVP or its equivalent, including Miguel Cabrera. Of the other 10, only six won the award: Rogers Hornsby (NL 1925), Jimmie Foxx (AL 1933), “Ducky” Joe Medwick (NL 1937), Mickey Mantle (AL 1956), Frank Robinson (AL 1966), Carl Yastrzemski (AL 1967). Of these six men, all but Frank Robinson led their league in WAR and led their team to the playoffs. Robinson finished behind WAR leader Earl Wilson by 0.2, but Wilson pitched that season for both the third place Tigers and ninth place Red Sox and finished 18-11 with a 3.04 ERA and 200 Ks. He finished a distant 14th in MVP voting, but would have been a singularly strange choice to win. What of the other 4 men? In 1934, Lou Gehrig somehow won the Triple Crown but only managed a fifth place finish in the MVP voting. The Yankees finished second in the league with 94 wins, 7.0 games back of the Detroit Tigers. Detroit catcher Mickey Cochrane won the award, despite finishing the season with a 3.7 WAR. Tigers teammates Charlie Gehringer (8.1) and Schoolboy Rowe (6.6) also finished ahead of Gehrig, as did Yankees pitcher Lefty Gomez (7.4). Gehrig led the league with 10.1 wins above replacement. Ted Williams managed to win two Triple Crowns, but finished second in the MVP award both years to Yankees. In 1942, Williams lost out to Joe Gordon, whose Yankees won the American League by 9.0 games over second place Boston. Williams led the AL in WAR with 10.2, while Gordon finished second with 7.8. After a stint in the military, Williams again won the Triple Crown in 1947, this time finishing second in MVP voting behind Joe Dimaggio. That year, the Yankees won the AL, leading third place Boston by 16.0 games. Again, Williams led the AL with a 9.6 WAR. Lou Boudreau was second with 7.2, while Dimaggio was ninth in the AL with 4.5 wins above replacement. What do these exceptions tell us? In the first few decades of MVP voting, baseball writers had a very simple formula: look at the team with the best record and pick their best player. Of course, they couldn’t even get that right, as shown in 1934, but that was the idea. This method managed to get it right in ’33 by snubbing the Triple Crown winner, but made baffling decisions in ’34, ’42, and ’47. The point is this: saying a Triple Crown winner should automatically win the MVP is patently absurd when they have lost 40% of the time. But that voting methodology persists to this day. Writers and talking heads are constantly declaring that “It’s not the best, but the most valuable.” In a sport like baseball, however, the best is the most valuable. In basketball, football, hockey, and nearly every other team sport, team dynamics matter. Baseball is often described as an individual sport disguised as a team sport, but that allows us to clearly delineate who made what contribution to a team’s season-long record. Trout made his team 10 wins better, while Cabrera made his team seven wins better. That the Angels missed the playoffs while Detroit made it has more to do with supporting casts and divisional strength. Arguing that the Tigers making the playoffs somehow means Cabrera was more valuable is ludicrous. For one, the Angels won more games than the Tigers. In fact, Detroit finished with the seventh best record in the American League in 2012. If we can agree that modern baseball has a system in place that can allow such a team into the playoffs, we should also be able to agree that voting based on what shows up in your newspaper’s box score is outdated and ineffective. The last argument is both absurd and hard to refute. In truly tied situations, I’m not averse to using how the voting will look to future generations as a tiebreaker. Of course, future generations will be increasingly statistically savvy, but there is also the possibility that Trout will have been a fluke. 20 years from now, there’s a chance that Zombified Murray Chass will say, “I can’t believe Cabrera never won an MVP! Especially that one year when he won the Triple Crown but we gave it to that rookie who never came close to his first full season.” Trout has the talent to have exemplary seasons for the next 10-15 years, but I don’t know that he will. It’s reasonably likely that he’ll never have this good of a season again: not many have, especially in recent history. Cabrera, on the other hand, will keep doing what he does. In fact, he may very well have better seasons: he did in both 2010 and 2011. So yes, if it were tied, you could argue this point and give it to Cabrera and I wouldn’t complain. But it’s not tied – hell, it’s not even that close. Mike Trout will almost certainly not win this year’s MVP award. He’ll have to settle for some exasperated nerds pleading his case on the Internet, and the hope that his case may force writers and fans to become better informed. That, and his millions of dollars, his solid-gold house, and his rocket car. Great article and great points! 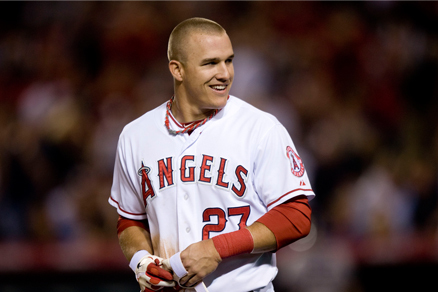 What a season from Mike Trout and a well deserved Rookie of the Year Award! If it wasn’t for Cabrera’s Triple Crown Season we would have definitely seen an MVP awarded as well. Trout's season was certainly one to remember. Very fun to watch as he plays the game the right way with hustle!